Makani webGUI stats: Displays complete system statistics for network, processes, mem/cpu, disks etc. 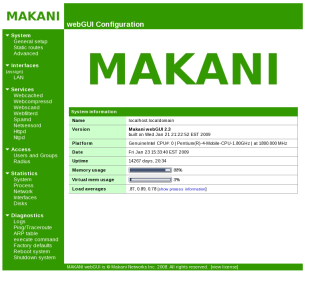 Makani webGUI configuration: With Makani webGUI you can dynamically configure or reconfigure various engines: compression engine, cache engine, webscan engine, webfilter engine, netsensor as well as ntp and http deamon. 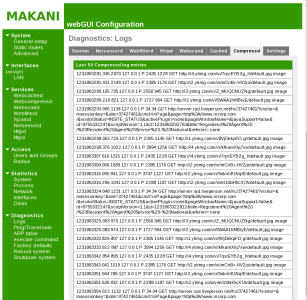 Makani webGUI logs: Displays various logs: system log, netsensor log, webcompress log, webcache log, webscanner log, webfilter log as well as httpd log.